PHOENIX (March 2, 2015) BAI Payments Connect Conference – Digital Check Corp., a manufacturer of check scanners and other equipment and software for the banking industry, has released a report projecting the future of check payments in the United States today at the BAI Payments Connect conference. 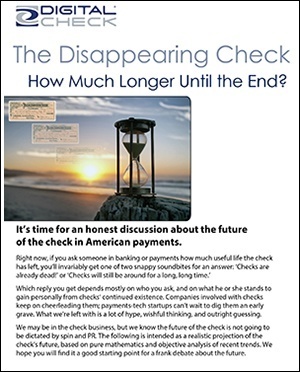 The document, titled The Disappearing Check – How Long Until the End?, addresses several major contributing factors to the decline in check usage, with predictions about how long the check will continue to exist in meaningful numbers. Why the customer’s age is not the primary determining factor in the use of paper checks, and other common myths. Digital Check is currently exhibiting at the BAI Payments Connect conference, at Booth 413. Also at the conference, Tom Jordan, Digital Check’s Director of Software Solutions, will co-host a session on the cost of problem images in the check clearing process at 9:45 a.m. on Wednesday. Digital Check provides superior check and document scanner products for teller, branch automation, remote deposit capture, and remote lockbox applications. The Northbrook, Ill.-based company was named one of Bank Technology News’ “Ten Technology Companies to Watch” in 2008 for its innovative products, and received a Bank Technology News’ Innovators Award for its affordably-priced CheXpress CX30 scanner. Digital Check’s SB, BranchXpress®, TellerScan® and award-winning CheXpress® series of electronic scanners are among the most cost-effective and reliable in the industry, and provide high-quality images with precise MICR accuracy.